The Danish Football Association (DBU) is looking for replacements for regular national team players for this month's matches against Slovakia and Wales after contract negotiations broke down. If the DBU fails to recruit players for the games, Denmark, who are ninth in the FIFAworld rankings and reached the last 16 at this year's World Cup, could face expulsion from the 2020 European Championship. 'UEFA has been pretty clear about this,' a DBU spokeswoman said. 'That would be the worst-case scenario'. She could not say if the association had been successful in attracting lower-tier players to play in the team's matches this month. 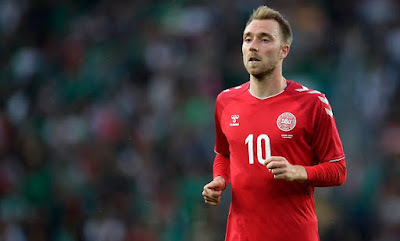 The dispute is chiefly over the rights of players, including Tottenham Hotspur midfielder Christian Eriksen, to make individual sponsorship agreements with companies competing with national team sponsors. The players' travelling conditions are also an issue. The DBU on Sunday rejected the players' offer to extend their existing contracts for the next two games which would have postponed further negotiations until after those matches. The DBU last year had to cancel a World Cup qualifying match for the women's national team against Sweden, also due to a contract dispute.